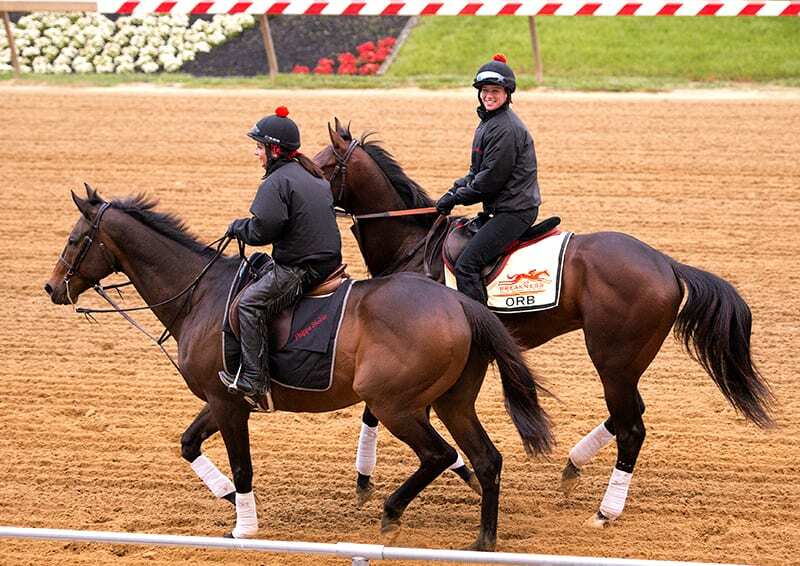 Jenn Patterson was the exercise rider for Kentucky Derby winner Orb in 2013, the duo shown here at Pimlico prior to the Preakness. Photo by Jim McCue, Maryland Jockey Club. Don’t expect trainer Jenn Patterson to be overwhelmed Saturday when she sends out her first horse of the year, first in a stakes and just the 18th in a fledgling career, in one of the marquee races on the richest day of Laurel Park’s winter season. As a former assistant to Hall of Fame trainer Shug McGaughey and the exercise rider and travel partner for 2013 Kentucky Derby (G1) winner Orb during his Triple Crown run, which included a stop at legendary Pimlico Race Course for the Preakness (G1), the 38-year-old Patterson is no stranger to being on the big stage. A native of Wilmington, Del., Patterson finds herself back in Maryland with Harry Rosenblum and Robert LaPenta’s Grade 3-placed stakes winner Uncontested for the 43rd running of the $250,000 General George (G3) Saturday. “To be able to not only get to the Derby but win, not a lot of people get to say that so that was a lot of fun,” Patterson said. “The horse was just doing so well. To be able to work with the Phipps’ and the Janneys’ and Shug and everybody, you can’t help but learn a lot from all that. Orb ran in all three Triple Crown races, finishing fourth in the Preakness and third in the Belmont Stakes (G1), and recuperated that summer with a string of McGaughey’s horses at the Fair Hill Training Center in Elkton, Md. The connections would eventually purchase a barn on the grounds and stable 28 horses, with Patterson at the helm.